This Pork Shoulder Soup is a great dish for these mid-fall Sunday afternoons. You can change this recipe to suit your fancy, like different vegetables, etc. Enjoy yourself!Note: You can change the number of people served by placing your cursor over "Servings". The Ingredients will adjust to the new number of servings. 1/2 inch ginger peeled and thinly sliced. Heat oil in a 14" flat-bottomed wok or 6-qt. dutch oven, over medium high heat; add pork and cook, stirring until browned, 8-10 minutes. Add garlic, ginger and bean paste: cook, stirring, until fragrant, about 1 minute. Add sugar, soy, snow peas and vinegar; cook, stirring until sugar dissolves. Add 6 cups water and bring to a boil; reduce heat to medium and cook until pork is very tender, about 2 hours. Bring a large pot of salted water to a boil and cook noodles until tender, 3-5 minutes. Drain and divide between 6 large serving bowls. 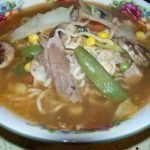 Ladle soup over noodles and garnish with scallions. Think of gochujang as similar to miso paste — a little goes a long way, but it's also very versatile.